I really didn't get this DVD at all. Even once I realized that this feature is "spring special" based on an established serial comic book in Japan, it still made me cringe. It would not have taken much more than a 10 minute explanatory prologue to make the film watchable. After, all the feature only went for 45 mins so its not like time was a problem. To be fair, I do have to point out that there are some positive aspects to this DVD. It has consistently nice animation, great environments and the plot has the potential to develop into a light hearted drama based on the stresses of kids going through the trials and tribulations of Tokyo University entrance exams. Unfortunately it loses the plot and ends up as a cross between Pokemon, Baywatch, and any daytime soapy of the variety emanating from America. The feature centres around a male student named Keitaro who is doing his entrance exams for the second time to get into Tokyo U. He appears to be a prefect at a local dorm for students in the area along with a female dorm prefect named Naru who is also doing her exams for the second time. The night before the final exam Keitaro professes his feelings for Naru, and just after they nearly kiss another female student named Shinobu walks in on them. Shinobu of course, has a thing for Keitaro. This is the theme for the rest of the feature, Keitaro lusts after Naru, who denies her own feelings for him, while Shinobu tries hard to ignore her own feelings for Keitaro once she sees that he won't reciprocate. The day of the final exam arrives, and Keitaro reads through the exam questions and consequently gets so happy that he knows answers to the questions, that he starts fantasizing about what he'll be doing next spring. He daydreams the exam away with the exception of the final five minutes in which he hurriedly fill out all the answers. He then cracks it with the world once he realizes he's blown his chances, and goes off on a fishing vessel to a pacific island to work on an archeological dig. From there he is followed by Naru, Shinobu and the rest of the girls from the dorm he stays at. Naru gets to the island first and witnesses Keitaro cavorting with a native female, which makes her immediately think the wrong thing. 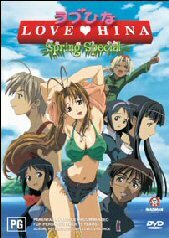 Naru and Keitaro make up, and continue on a quest to find the native girls lost guardian and an ancient turtle civilization. The rest of the all girl gang finally arrive at the same island, but via ridiculous and implausible ways that really don't make any sense unless there is some sort of history between the girls and the characters whose transport they hijack. The stupidest of these is a giant turtle that the younger girls use to travel to the island. The gang reunite at an oasis, and consequently encounter a giant rampaging stone turtle. They are saved by the incredibly lame singing of the native girl. Said giant turtle then transforms into hundreds of turtles from the ancient civilization, who amazingly change their front feet into flippers and fly away. The native girl follows and leaves the gang. The gang then tells Keitaro and Naru that they both passed their exams and will get into Tokyo U. A few more choice scenes of sentimental drivel ensue and the feature is complete. But wait there's more; pathetic unnecessary body shots of the older female gang members abound, and have no point in the plot other than as eye candy for the depraved viewer. However, no one interested in the body shots could watch past the banality of the first 10 minutes, so I can't understand why the director would place them in the movie in the first place. Final analysis; don't waste your cash unless you are already a fan of the comic or TV series. 4:3 Frame ratio. This show had nice clean serviceable animation in the traditional Manga style. The picture is light and clean, and easy on the eye. The soundtrack to this show is surprisingly normal, and the sound effects are relevant to what is going on. The English translation was good, and the English voices used were exactly right for the roles they were playing. Textless endings and openings for Spring special, and the TV series. Madman trailers- Angelic layer, King of Bandit Jing, Last Exile, Excel Saga, Jubei clan and Hack sign. This would have been the perfect place in the DVD to have an explanatory addendum to the series for those first time viewers.